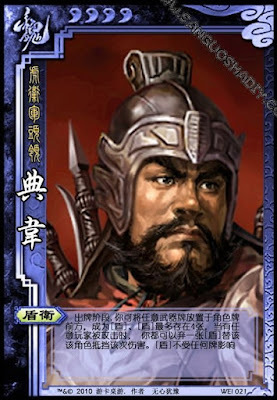 During his turn, Dian Wei can put any weapon cards in front of him. These are shields, and he can have at most four. Whenever any player is attacked, he can discard a shield to prevent the damage. Dian Wei saves a player after the target fails to produce an Escape. All the damage is negated, and the attack is finished. The attacking player cannot use the Axe or Green Dragon Blade. Dian Wei can use his power to protect himself. Dian Wei's Shields cannot be affected by any other players.